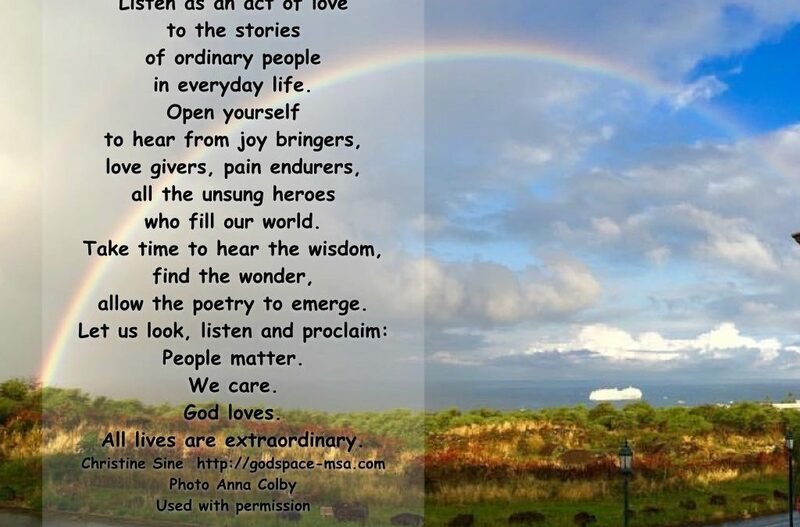 If we take time to listen, we’ll find wisdom, wonder and poetry in the lives and stories of the people all around us…. we all want to know our lives have mattered and we won’t ever be forgotten…. listening is an act of love. Dave Islay Listening is an Act of Love. This week as part of my reading discipline on listening I have delved into Dave Islay’s book Listening Is an Act of Love, in which he recounts some of the stories gathered through the Storycorps project, in which people across America were given the opportunity to share the stories of their lives. As I read the book and watched the video below, I started to wonder: Where do I hear the stories of ordinary people in everyday life? As I sat and thought about this I realized it is mainly through Facebook. The sharing of joys and heartache, of family photos and garden beauty, the ask for prayers of healing, strength for the day, sustenance in the grief of death all speak of longing to have our stories acknowledged by others. We all want to know that our stories matter to others and to God. The question is: how many of us truly listen. To be honest sometimes I am a little overwhelmed by what I read and I need to listen selectively, but I also want my friends to know that their lives do matter and I care about their stories. Paying Attention to My Special Facebook Friend Niki. One of the most beautiful and poignant stories I have followed on Facebook is that of the life and death of my friend Niki Foster Hibbert. When Niki was diagnosed with metastatic breast cancer in September 2014 she started a Facebook group Seasons of Grace, with the intention of posting 1,000 daily moments of her story and the grace of God in the midst of it.Niki and her family came to Seattle in April last year on a memory creating trip to Disneyland, as well as to visit many of her far flung Mercy Ship family. I relish that visit and the wonderful memories I will always have of Niki from it. Sometimes God asks us to do hard things, things we get to mull on and ponder over and pray about. Sometimes hard things are just given to us, laid on our laps almost. No rhyme or reason, no instruction manual with 15 steps to follow, no emergency landing strip lighting the way and telling us where to go. At times like this we often come to a cross-road in our life … And even more so, in our faith, a faith that was typified by being rock solid has had a wee shake, and with the shake come questions – unanswerable questions “Why?” Is there ever really an answer to that? I understand why people ask those questions, and sometimes I want to ask and sometimes I just don’t want to know what the answer is. I guess for me the journey has always been about having enough grace for each day. I think it’s a little like God when he sent manna daily from heaven to feed Moses and the Israelites (Ex 16). It was a provision for that day only (apart from the day before the Sabbath when they had to gather enough for the Sabbath as well). This provision sustained and nourished them. It must have also confirmed to the Israelites that God remembered them, how could he forget! His eye was still upon them. I think God’s grace is like that too. It is there for me, all I have to do is expect the provision from God and go get it. This journey is mine alone, and God’s grace is for me. There are lots of family and friends walking, kneeling, alongside me, but their journey is different, the grace that they need is different … they are not me. They need to draw on their own grace for each moment of each day, and I need my own portion too. Daily. Fresh grace every day, fresh manna every day. And the only one who can do that for us is our precious Heavenly Father. With outstretched arms he draws us to himself and tops our diminishing grace-tanks up, allowing us to refresh and restore, and then sending us on our way again, always keeping an eye on us. In some ways Niki and her daughter Alicia are ordinary people. In other ways they are quite extraordinary and I am very grateful that Facebook has made it possible for me to share a part of their life stories. As you read this reflection are there names that come to mind of Facebook friends or others whose stories you should listen more deeply to? Are there people you need to pay more attention to? You might like to take time to watch the video below and reflect on the life stories that are share here too.